It's been more than three years since I last put together a guide to food and drink options in the King's Cross area. Back then, there were a few interesting places, if you knew where to look, but no great coffee, burgers or pizza, and little in the way of fine dining. Thankfully, the area has since become a foodie hub with exciting new openings almost every month. As such, I thought it was time to make an updated area guide; scroll to the end for the Google Map version. Aux Pains de Papy. A traditional, family-run French bakery that serves the best pastries in King's Cross. 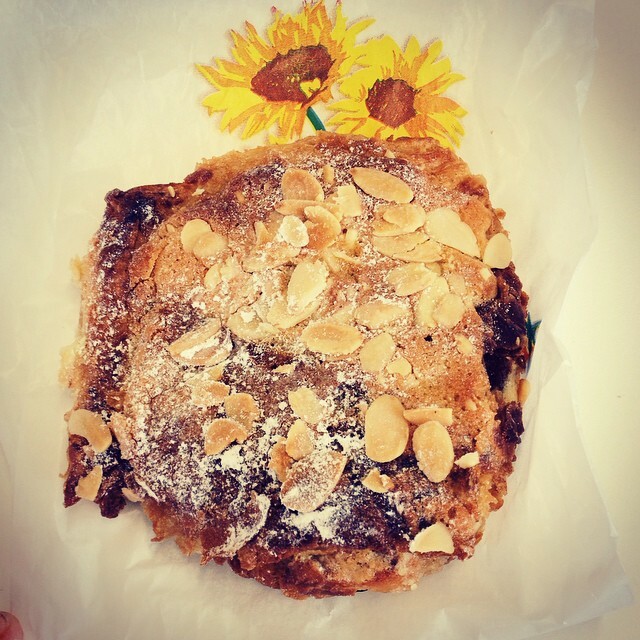 The almond pain au chocolat is particularly divine: it's flaky and rich, and saves you from having to make the difficult choice between a pain au chocolat and an almond croissant. Aux Pains de Papy is located at 79 Grays Inn Road, London, WC1X 8EB. Notes. For years, I mourned the absence of a decent coffee shop in King's Cross, but now I am spoiled for choice. Notes, on Pancras Square, is my favourite, with its excellent espresso blends and cold brew, and lovely café. If you're taking away, I would also recommend DASH on Caledonian Road, and if you want a hand-brewed filter coffee, head to Caravan. My review. Notes is located at 1 Pancras Square, London, N1C 4AG. Caravan. The only problem with Caravan's brunch menu is that they only serve it at weekends, which means I don't get to eat it too often. 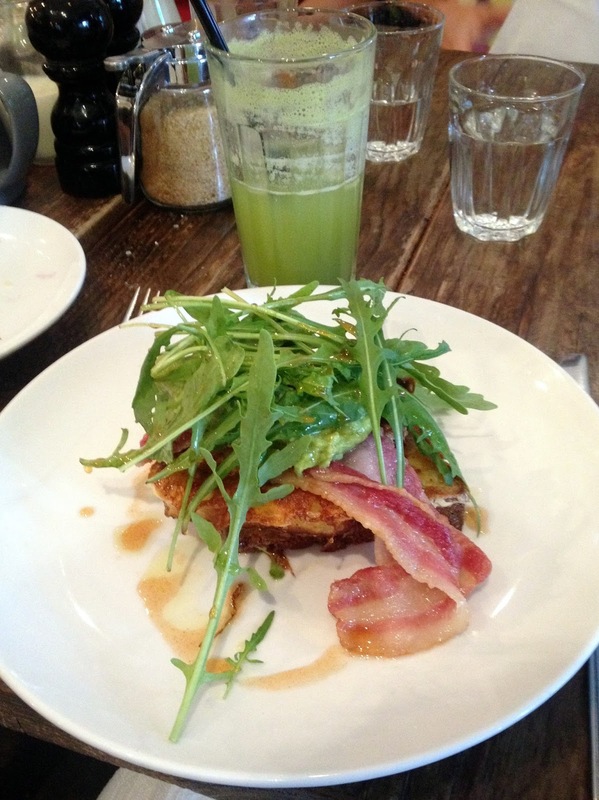 You can't really go wrong when ordering but my favourite dish is the cornbread French toast with bacon, rocket and avocado. If you're in the mood for something sweet, try the pumpkin waffle with ricotta, maple and pecans. You can also sample the salted-caramel hot chocolate or the excellent coffee, which is roasted on-site. Granger & Co, on Pancras Square, also does a top-notch brunch, although it's a little more expensive. Caravan is located at Granary Building, 1 Granary Square, London, N1C 4AA. KERB. The nomadic street-food market formerly known as eat.st was one of the first exciting foodie venues to come to King's Cross. The market has rebranded as KERB, grown and relocated to Cubitt Square, just behind Granary Square. Most days, five or six different street-food vans come along for lunchtime serving everything from poke and fried chicken, to summer rolls and fish and chips. There are benches, fountains and grassy areas on Cubitt Square, where you can enjoy your lunch on a nice day. KERB is open from 12–2 pm on weekdays. KERB is located at Lewis Cubitt Square (off Stable Street), London, N1C. Honest Burgers. It was a very happy day when I found out that Honest was opening up a new branch in King's Cross. I was even happier when I managed to wangle a 20% discount for my company during Honest's first month; as I go there about two or three times per month, they have definitely got their money's worth! The burgers are consistently in my top three London burgers — the Honest Burger, with red onion relish, bacon and cheddar, is bloody great — and the rosemary salt chips are delicious. The King's Cross branch is fairly small but you never have to wait too long for a table. My review (of the Soho branch). 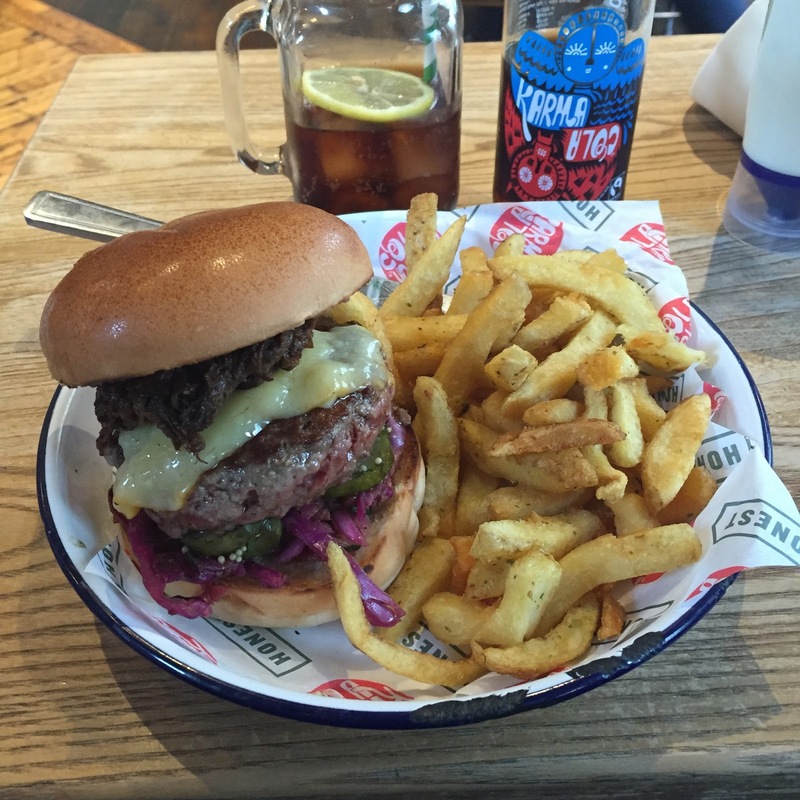 Honest Burgers is located at 251 Pentonville Road, London, N1 9NG. Pizza Union. 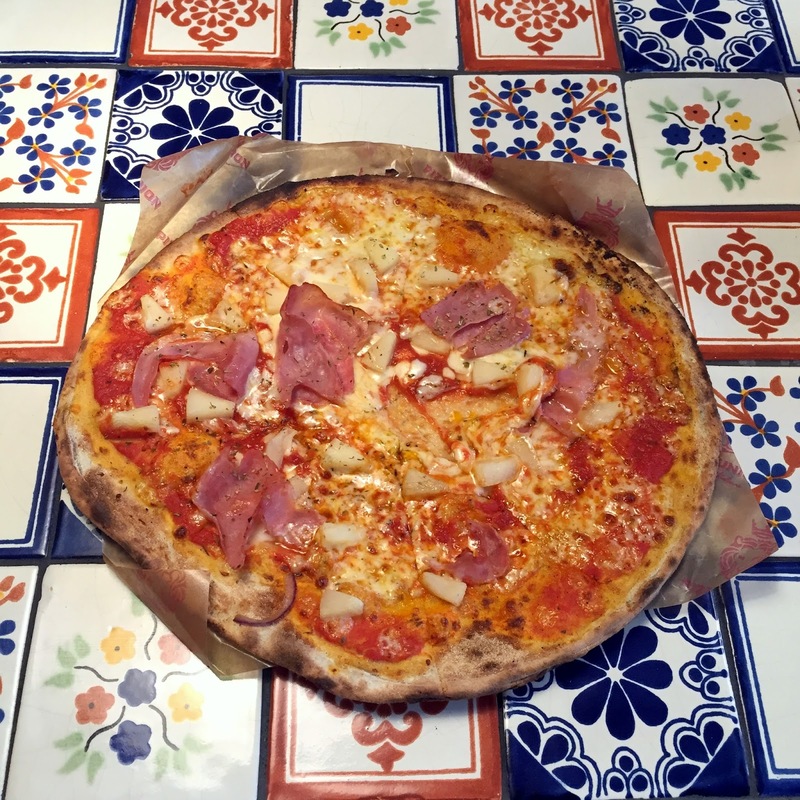 Super-fast Roman-style pizza in a stylish, colourful restaurant for under £4? I was skeptical when Pizza Union opened up on Pentonville Road offering precisely this, but the pizza is very good indeed: thin and crispy and with good-quality toppings, for the same price as a sandwich in a chain shop. Pizza Union also serves delicious ice cream and has some of the prettiest tiled tables in town. Caravan also does great pizzas, but they are twice the price and are more suited to a long lunch than a quick bite. My review. Pizza Union is located at 246–250 Pentonville Road, London, N1 9JY. Dishoom. There are plenty of reasons to go to Dishoom: the delicious, interesting and reasonably priced Indian street-food, and the gorgeously designed, multi-level interiors, for example. The cocktails are also rather epic. The basement bar at the King's Cross is decked out like the coolest train station waiting room you've ever visited, with sleek booths and gorgeous teal accents. The cocktail menu is extensive, with plenty of Bombay twists on the classics. My favourite is the Edwina's Affair, which pairs gin, rose and cardamom with mint and candied rose petals. It's refreshing, subtly sweet and comes served over ice in a copper cup. The chilli martini and the chaijito are my other recommendations. My review. Dishoom is located at 5 Stable Street, London, N1C 4AB. Grain Store. The fruit- and vegetable-centric menu at Bruno Loubet's restaurant often surprises and always delights. Carnivores, fear not: there are meat dishes on the menu, even if the meaty elements sometimes fall into the shadows of their showier vegetarian counterparts. The dishes are inventive and come impeccably prepared, and the cocktails are creative and well mixed. The service is also top-notch. I went for my 30th birthday and would whole-heartedly recommend it for a special meal. My review. Grain Store is located at 1–3 Stable Street, London, N1C 4AB. Try Roti King near Euston. Thanks for the suggestion; I've never been!